← Now Open Coco Blue Nail Salon & Spa in Blue Bell, PA! In a world where credit cards are accepted almost anywhere and payment transfers are easy via apps, many customers simply don’t carry cash around with them. 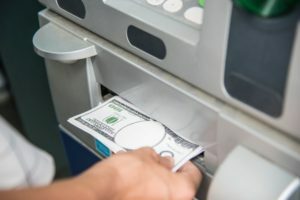 It’s absolutely necessary for cash-only businesses, or businesses that only accept cash tips, to have an ATM on the premises. More sales. With an ATM, customers have more access to their money, so they’re more likely to spend it. The fact that they don’t have enough cash is no longer an impediment to how much they spend. More foot traffic. Being one of the only establishments on the block with an ATM means many more people visiting your business. Customers who may not even realize they want or need your services will now have more awareness about what you do. More profits. Your store gets a percentage of the surcharge revenue from the ATM, which means that even if customers are visiting your business only to use the ATM, you are still earning a percentage of their business. And because it’s free to get your ATM installed, there’s no cost to you! Discover True Convenience with Advance To Go!